Universal education, paid for by taxes, and free at the point of delivery was a revolutionary idea. (My commentary): If someone had proposed this today in America, it would be dismissed as socialist. Capitalist advocates (rich business leaders) are especially poor at estimating the long term returns on investing in people. After all, the market lets you select the best from an infinite pool of workers. What they don’t realize is that poor education means there is little difference between the best and the worst, and that few of the people are actually prepared to work at their full potential. The existing education paradigm is based on an emphasis of deductive reasoning and a knowledge of the classics. This particular intellectual model of the mind is what we’ve come to think of as academic ability, and it is deep in the gene pool of education. My thoughts are that reasoning is very important to teach, but that there are multiple types of reasoning, and multiple knowledge sets one can absorb (beyond the classics) that become a set of tools for refining one’s reasoning. For example, although I have studied science from grade school through PhD, I’ve never had the opportunity to explore inductive reasoning techniques – the kind that are now part of my complexity-based evaluation research. Schools serve Corporate Industrial interests, and are still modeled like factories. Because people are more diverse than factory parts, problems arise. 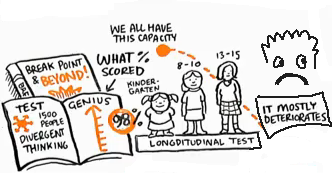 Divergent Thinking is a critical skill for the next century. 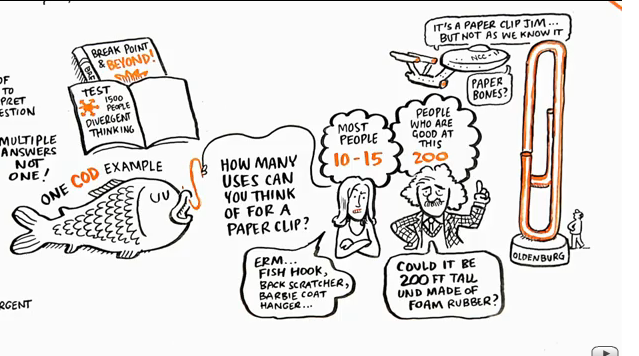 I’ve explained the paperclip experiment recently, as part of my Innovation in Chunks series of posts. Being able to identify many new uses for a paperclip is probably a direct predictor of whether that person can come up with new uses for existing consumer parts and products, and thus new business ideas. And clearly, the evidence shows that formal education erases our innate ability for divergent thinking. However, some kind of education must foster this for pre-schoolers, because I haven’t seen armies of rampaging divergent thinkers in the villages of Africa either – where most of the kids aren’t in school. The conclusion is that we need to mix some elements of pre-school back into the formal curriculum. I’m thinking we need more experiential learning, more problem-oriented classes, and more group interactions.